Femto engineers performed FE-analysis for BARTEC in order to verify if their newly developed explosion resistant enclosure for the mining industry, could withstand explosion tests necessary to obtain an EC-type examination certificate. The BARTEC Group is the leading global provider of high-quality industrial safety technology for applications in hazardous areas. BARTEC specialists develop, produce and sell solutions for all areas where people work with hazardous substances such as combustible liquids, gases and dusts. Customers primarily include companies from the oil and gas industries as well as chemical, petrochemical and pharmaceutical companies from around the world. Electrical sparks can be extremely dangerous in the mining industry. They might ignite flammable gasses and cause an explosion. To prevent an explosion, the enclosures of the electrical equipment have to comply with several regulations. One concept of explosion prevention is the pressure resistant enclosure. A spark only ignites the gasses inside the enclosure, and transfer of the explosion to the gasses outside is prevented by absorbing the explosion energy by the deformation of the enclosure. Any gaps to the outside of the enclosure required for the functioning of the equipment are made long and narrow, so the escaping gasses will have lost the energy to ignite the outside gasses by the time they exit the enclosure. Any gaps required for the manufacturing process are sealed with an adhesive. In the event of an explosion, the stresses in the material of the enclosure are distributed more evenly and the amount of plastic deformation is reduced. 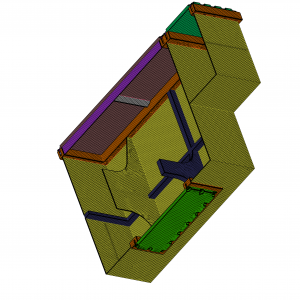 Femto Engineering performed a non-linear analysis on the design of the pressure resistant enclosure. The results of the calculations were used as a baseline for an optimized design. The optimized design was also verified by FE-analysis. The outcome was satisfactory. We used Femap/NX Nastran for this assignment. 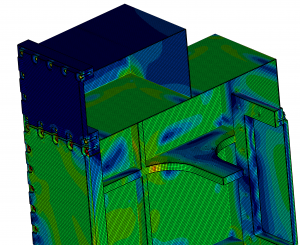 The FE-analyses performed by Femto Engineering reduced the number of prototypes required while optimizing the design of the enclosure in terms of weight, material stresses and deformations. We hope you liked this case study. Want to hear more? Contact us! Also if you are interested in our analysing, simulation or optimization services get in touch!